'Supernatural' Season 14 Episode 18 Recap: "Absence"
The CW’s Supernatural finally did it. It rid us of one of the blandest characters we’ve seen on any show. Mary Winchester (Samantha Smith) is complete – this being the exact statement for her eventual fate. Many fans have been asking the showrunners for years to rid us of Mary’s presence (she’s never lived up to her position as the boys’ mother) and it looks like our wish has been granted. Supernatural season 14 episode 18 “Absence” begins exactly where the previous episode left off. Sam (Jared Padalecki) and Dean (Jensen Ackles) return to HQ and can’t find Jack and Mary anywhere. Castiel (Misha Collins) informs them of Jack killing the snake a couple episodes back, and a livid Dean begins his usual schtick of treating Cas like dirt whenever he’s angry. Sam tries to locate Jack’s phone, but it appears the boy is flying from one country to another within a matter of seconds. 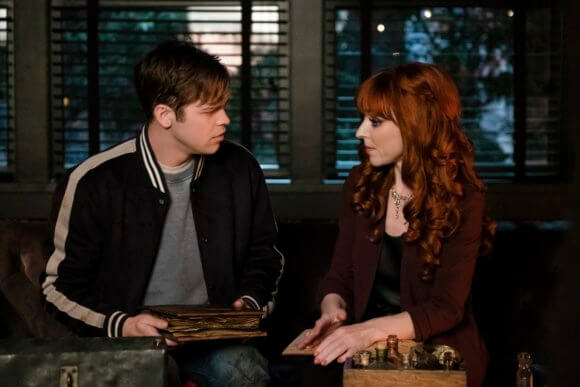 When Jack (Alexander Calvert) returns to his original location, he finds the hallucination of Lucifer taunting him about how killing Mary Winchester is the deal breaker for the Winchesters. A repentant Jack insists it was an accident, but Lucy keeps mocking him. Castiel tries to apologize for not informing him what Jack was becoming, but Dean has no time for it. Sam calls Rowena (Ruth Connell) to track Mary down, but Rowena ominously tells him Mary can’t be tracked since she’s no longer on Earth. Dean destroys stuff around him in a rage and tells Rowena to use the Book of the Damned to bring Mary back. He then commands Castiel to go to Heaven and find Mary. (Seriously, Dean was impossible to like in this episode.) However, Rowena is greeted by Jack himself who wants her to do the same thing Dean wants. Rowena tries to stall for time before the Winchesters arrive, but Jack catches on to this and teleports her to the bunker with him just as the boys break down the door. Sam and Dean, clueless what to do next, take a moment to talk about how Jack failed them. For some reason, these two boneheads blame Jack even though he’s soulless and it’s not really the boy’s fault; regardless, Sam reasons that the blame isn’t all on Cas since he and Dean also played a part in resurrecting Jack. Meanwhile, Castiel is greeted by a bemused Duma – no reasons given for why she’s being so unwelcoming to him – who informs Cas that Mary is in Heaven and peacefully there. She’s complete, according to Duma, meaning her story is over. Jack’s busy forcing Rowena to complete the spell, but when she refuses, he flings her back to her apartment. Rowena warns Sam and Dean over the phone what Jack is about to do, and the brothers race over to Jack’s location. According to Rowena, reviving the dead with magic would mean a possibly evil version of Mary would come back. Jack’s still able to complete the spell, but only Mary’s body is returned. It’s a shell of what she was, with no capacity for life. Jack, thoroughly shattered by this, teleports away. He’s visited again by Lucifer’s hallucination who tells him that now not only do the Winchesters not trust him, Jack can’t trust them anymore either. This seals the fact that Mary is definitely gone, and the boys return to the bunker heartbroken. Castiel also returns and informs them that he came across Mary’s heaven, and entered to find her with John. (It looks like a huge plot hole all the way back from season two has been solved and John is confirmed to be in Heaven.) This is consolation enough for Sam, it seems, while Dean doesn’t react with any kind of joy over Mary’s newfound peace. Dean insists they give Mary a hunter’s funeral, and the boys burn the shell of a body Jack brought back. A remorseful Castiel tries to move in to comfort Dean, but a tactful Sam stops him from doing so – the younger Winchester might be calm, collected, and forgiving, but the older Winchester is mainly made up of rage and guilt; most likely not too fond of Castiel anymore. The episode had featured sporadic flashbacks to Mary’s time with all the main characters, and you know how badly she had been characterized when the show felt the need to interject these sudden flashbacks to make Mary seem more of a well-rounded person than she was ever shown to be. In any case, the final shot is of her name being added to the bunker’s table carving, signifying that she had made a permanent mark on Sam and Dean.